There’s nothing like an iPhone launch to bring out a crowd. Apple’s latest phones—the iPhone 5c and iPhone 5s—hit retail shelves on Friday. And at Apple Stores in 10 countries around the world, people lined up in anticipation of doors opening at 8 a.m. local time so they could get their hands on the new models, just as they had for previous iPhone launches. Friday’s iPhone launch brought the usual crowds to New York’s Fifth Avenue Apple Store, but the fact the iPhone 5s wasn’t available for preorder meant a larger turnout. “Everyone is just crazy for the iPhone,” said Artur Mardanov, who waited in line for 20 hours only to emerge from Apple’s flagship Fifth Avenue store in New York with two iPhone 5s models. Software engineer Jose Marinez got up bright and early Friday morning to order his iPhone 5s online. But when he found out that his order wasn’t expected to ship until October, he headed out to the Fifth Avenue store to stand in line. He had come prepared, though, with a comfortable chair. Jose Marinez has been to enough iPhone releases to know to bring a comfortable chair. The iPhone 5s appeared to be the main draw for crowds at Apple Stores on Friday—after all, you could preorder the iPhone 5c a week ago. But people lining up for the 5s still had color on their minds; specifically, the gold-colored version of the new smartphone looked to be a popular choice among would-be shoppers. At the Apple Store on Walnut Street in Philadelphia, for example, store employees announced 38 minutes before the iPhone launch that all the tickets for 16GB gold phones had been given away to people in line. That news was greeted by audible grumbling from the rest of the crowd. 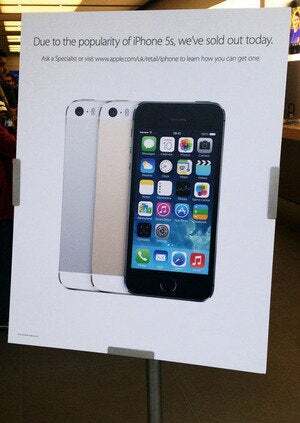 Similarly, at the Apple Store in Palo Alto, Calif., gold iPhones ran out of stock after about 30 customers, while the Cambridgeside Galleria Apple Store in, Cambridge, Mass., ran out gold iPhones about 35 minutes into sales. 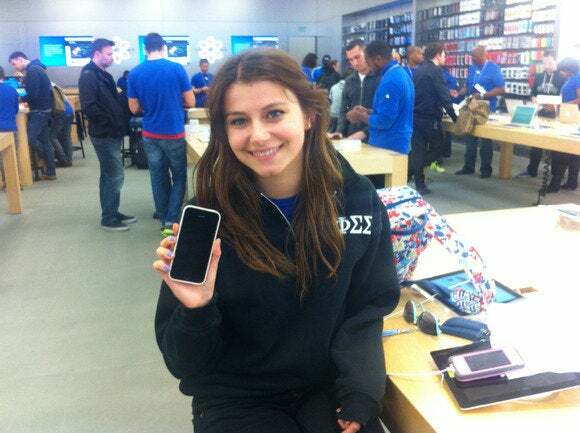 Student Iryna Hrubiy holds up her space gray iPhone 5s. Apple Store employees handed out tickets, like this one in Cambridge, Mass., so that people waiting in line could claim their iPhone by the time they reached the store. The best way to ensure yourself a golden iPhone was to turn up early. In San Francisco, Thang Nguyen secured his place at the front of the line by arriving at 2 p.m. on Thursday. After an 18-hour wait, he was able to secure the only 16GB gold iPhone 5s in stock at the San Francisco Store. “Worth it to me to get the gold one,” Nguyen said. 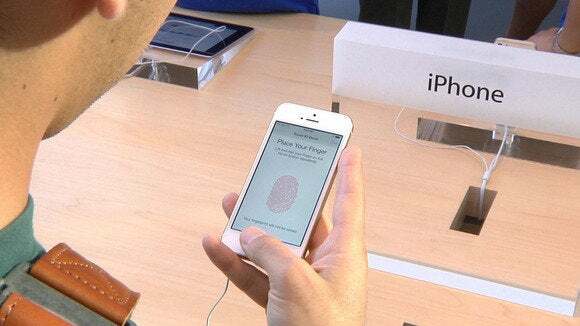 A customer tries out the iPhone 5S fingerprint sensor at the Apple Store in Palo Alto, California. But there’s more to the iPhone 5s than just a new touch of color. Apple’s latest phone boasts a speedier processor, camera improvements, and a new security feature called Touch ID. The capacitance-based scanner is built into the iPhone 5s Home button and uses your fingerprint to grant access to your phone. Touch ID certainly caught the eye of Marinez, the software engineer waiting to get his iPhone 5s in New York. I have a lot of sensitive documents, and if I lost my phone, I’d be in big trouble,” he said. At the Apple Store on Philadelphia’s Walnut Street, store employees help set up customers with new iPhones. In Philadelphia, Hrubiy also was looking forward to taking advantage of Touch ID. “I always know people are going to go for my phone, so I have the code put in there, but it takes forever to do that constantly,” she said. Andrew Booth, in Philadelphia for business and taking advantage of his proximity to an Apple Store to buy an iPhone 5s for his wife, thought Touch ID might have uses beyond its initial features. “I think it will be used for other applications eventually, particularly for PayPal,” he said. By the time the Fifth Avenue store opened on Friday, the line stretched for blocks. Other customers seizing the opportunity to line up for a new iPhone Friday were doing so because they live in places where the 5c and 5s had yet to go on sale. 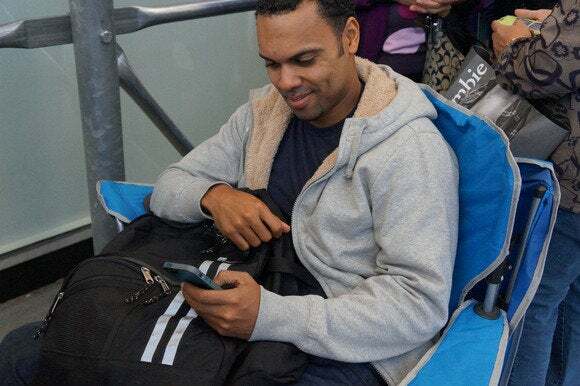 Developer Jordan Clist was vacationing in San Francisco when he stopped by Apple’s Stockton Street store to grab an iPhone 5s before returning to his home in New Zealand. “I’ll be the only one there who has one,” he said. 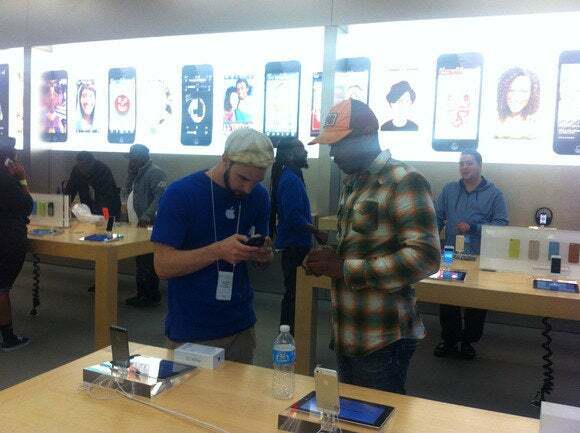 Customers looking to grab an iPhone 5s on launch day had plenty of company. In Philadelphia, the line began forming at 11 a.m. on Thursday; by Friday morning it stretched all the way down the block—a longer line than greeted last year’s iPhone 5 launch at the same store. At New York’s Fifth Avenue store, the line for an iPhone had stretched around three blocks by the time the store opened its doors. The iPhone 5s was a popular item at the Regent Street store in London. That scene repeated itself around the globe. A huge crowd—with some estimates as high as 1500 people—massed outside of the Regent Street Apple Store, with the line stretching down Hannover Street into Hannover Square Gardens. Back on this side of the Atlantic, the crowd wasn’t as large at the Cambridgeside Galleria outside Boston, but a healthy line of around 200 people formed in anticipation of the iPhone’s arrival. Some people who queued up at the Stanford Shopping Center Apple Store in Palo Alto got more than a chance to pick up a new iPhone; they also rubbed shoulders with top Apple executives. CEO Tim Cook was there as doors to the store opened, as were senior executives Eddy Cue and Phil Schiller. 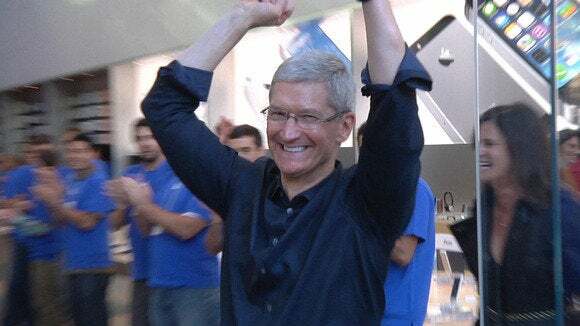 Apple CEO Tim Cook leaves the Palo Alto Apple Store, shortly after the iPhone 5S and 5C go on sale. Caitlin McGarry reported from New York; Joel Mathis reported from Philadelphia. Macworld’s Dan Frakes, Serenity Caldwell, and Hayden Dingman contributed to this report from Palo Alto, Calif., Cambridge, Mass., and San Francisco respectively. Karen Haslam of Macworld UK contributed to this report. Updated at 12:30 p.m. PT to include more information from West Coast iPhone launches.